Twentieth Century Fox doesn't do a slew of animation pictures, but when they do one, they tend to do it right. 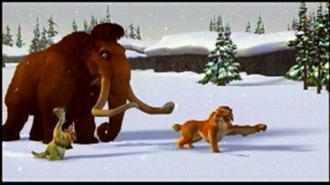 Fox Animation hit one out of the park with "Ice Age" (2002), a tale about assorted prehistoric mammals faced with new challenges when things start getting colder. 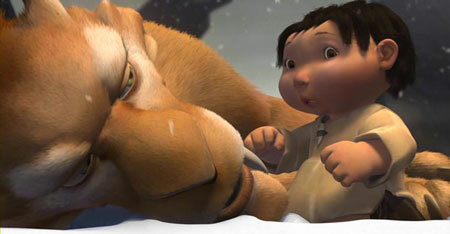 Directed by Chris Wedge and Carlos Saldanha from a story by Michael J. Wilson, "Ice Age" twas one of the surprise hits of 2002 and led to several enormously popular sequels. 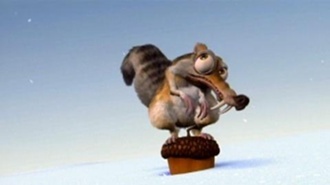 A saber-toothed squirrel, Scrat (voiced by Chris Wedge, though Scrat doesn't speak, just makes sounds), is trying to find a place to store his prized acorns. Innocently, he tries pounding them into the icy ground, which suddenly splits open beneath him, causing a rift that rapidly grows until it extends to the horizon. This sets off an avalanche and other disasters. Then, Scrat is stepped on by a herd of fleeing animals, all heading south. 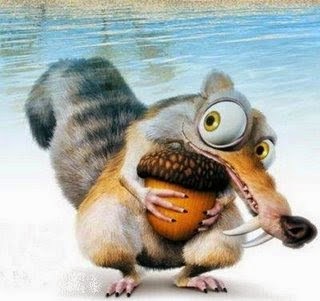 It's turning into a real bad day for Scrat, but he perseveres, continuing at intervals throughout the film to try and bury the acorns, without much success. Nearby, Sid (John Leguizamo), a wisecracking, clumsy sloth, is attacked by two large rhinoceros-like beasts. 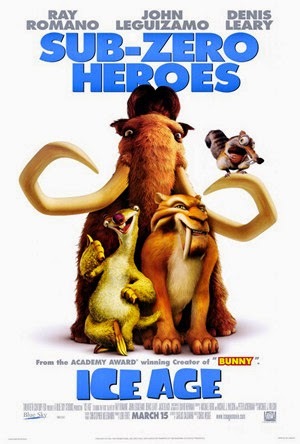 He is saved by Manny (Ray Romano), a deadpan, cynical mammoth who sends them packing. 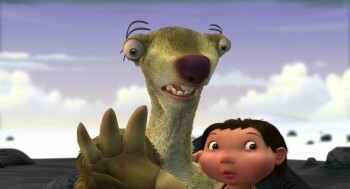 Sid and Manny become friends and team up. The humans, who don't stick around long. Oh... and nice threads. Meanwhile, Soto (Goran Visnjic) also is nearby. He is a Smilodon, a fierce line of big cats kind of like sabertooth tigers. He has a grudge against a tribe of humans and plans on raiding their camp, carrying off the chief's baby son and eating him. After an attack fails to produce the child, Soto sends his malevolent crony Diego (Denis Leary) off to kidnap the baby for him. Sid and Manny wander into Soto's realm and stumble upon the chief's baby and his mother, who have escaped from Soto by jumping over a waterfall. The mother mysteriously disappears, leaving the baby in Manny's care. Looking for the father, they can't find him - the humans' camp is deserted. Instead, they run into Diego, who is overjoyed at his good fortune. Not knowing Diego's true motives, they all join up until Diego guilefully guides them into an ambush. The three animals bond during their journey, but the final showdown with Soto looms. 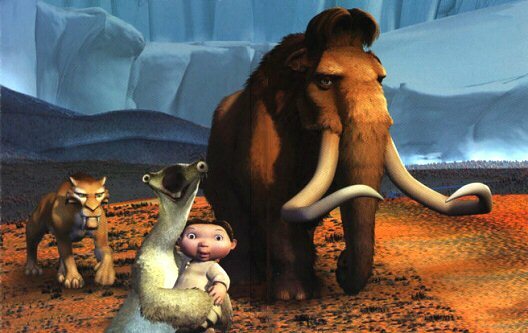 While a comedy with many historically impossible aspects, "Ice Age" is a great introduction to many animals that have long been extinct. Apparently, the producers brought in experts to help select the animals to use, and those experts had only one ultimate bottom line: no dinosaurs, which had died out long before. Thankfully for scientific integrity, there is not a Brontosaurus or T. Rex to be seen - not, at least, until they were introduced in one of the sequels. The likeable characters will amuse children, while very few adults will recognize all the animals. There are a few pop cultural references thrown in for laughs, such as a crashed flying saucer and asides about global warming. Combined with state-of-the-art computer animation, this is a very sophisticated film that isn't your usual "The Smurfs" "Hey, we're in New York!" set-up. Anyone should find something to like in this film which is voiced mostly by well-known tv character actors. The best thing about the film, quite simply, is that it is gorgeous. The DVD transfer is as good as any on the market, and the Dolby surround sound will make you glad you invested in all those speakers. It has a less cartoony feel than "Shrek" or "Monsters, Inc.," to which it is often compared. However, don't be put off by that: it isn't one of those moralistic tales that try to tell kids how they should live or tries to teach them paleontology. 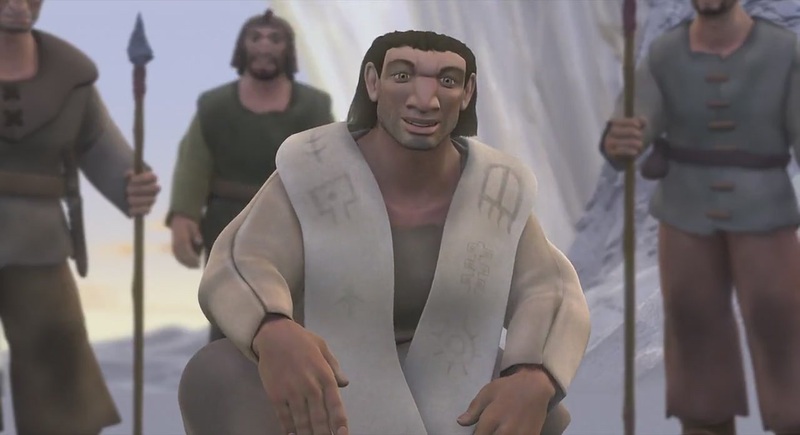 "Ice Age" just gives simple insight into how people act in order to get along. A straightforward tale of relationships between animals who are well-rounded and develop as the film progresses, the film is a lot of fun. 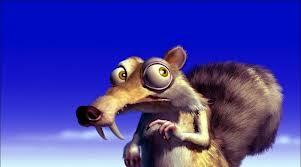 Many will find the minor character Scrat the real star of the film and the one they like the most. The knowing wise-cracks by the other animals about their own futures will entertain kids and adults alike. 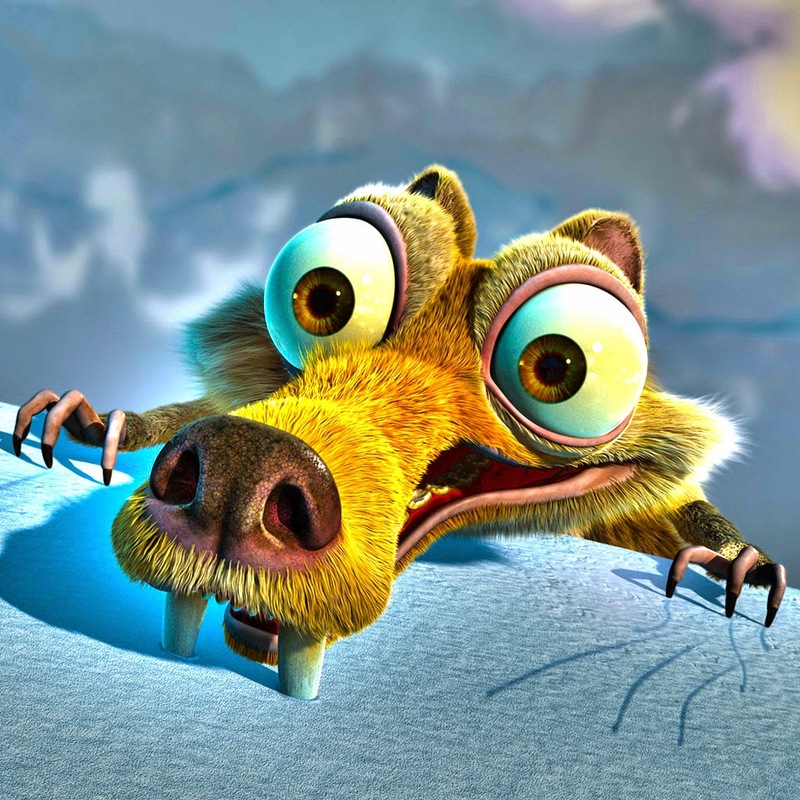 Scrat is the real star of "Ice Age"
Adults, though, may take extra delight from sequences in the film that remind them of the old "Roadrunner" cartoons of Chuck Jones. These references are a worthy tribute to Jones (which apparently was intended). More than that, "Ice Age" is one of the top animation films to date, which served as the foundation for one of the top animation franchises of all time, right behind "Shrek" and ahead of "Toy Story" in total grosses. This should be at the front of the shelf, right beside those classic animation films. Cars 2 (2011) - Another Wild Funny Car Romp! The Smurfs (2011) - Smurfs Take Manhattan!